Hey y'all! I hope you had a great weekend! We spent our weekend staying busy at usual with good food, a soccer game, painting class for the girls, shopping, a quick impromptu trip to the zoo with family, a cookout, and picking out items to spruce up our living room. 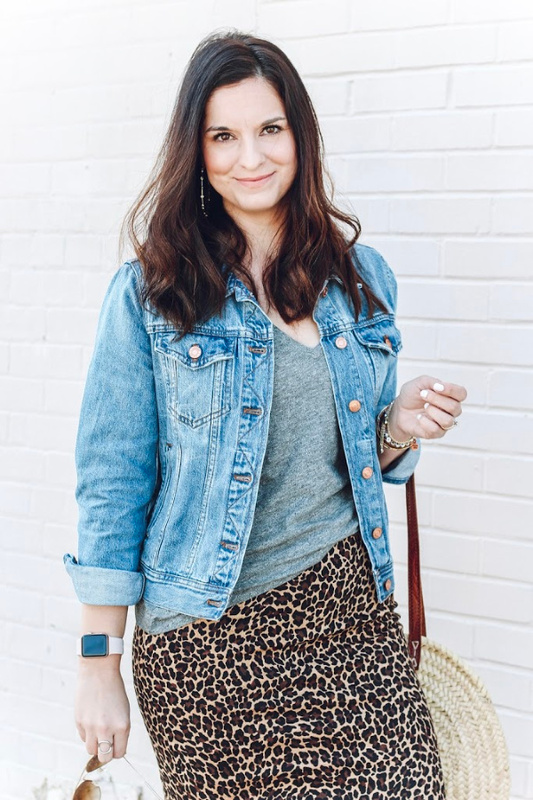 I had fully intended to share some of my favorite picks from the Target and Hunter collaboration but I was very underwhelmed by the selection. The one thing I was planning to actually purchase (the women's tall boots), weren't even available to purchase at all. So, I'm switching it up and sharing the items we bought for our living room. I shared my favorite picks from The Opalhouse collection at Target last week and it totally inspired me to finally buy some things that I genuinely love for our space! First of all, I have to say that my husband is quite the trooper. He lives with three ladies, is the best girl dad, and just fully embraces our love for the color pink. I mean, he did paint our front door pink! 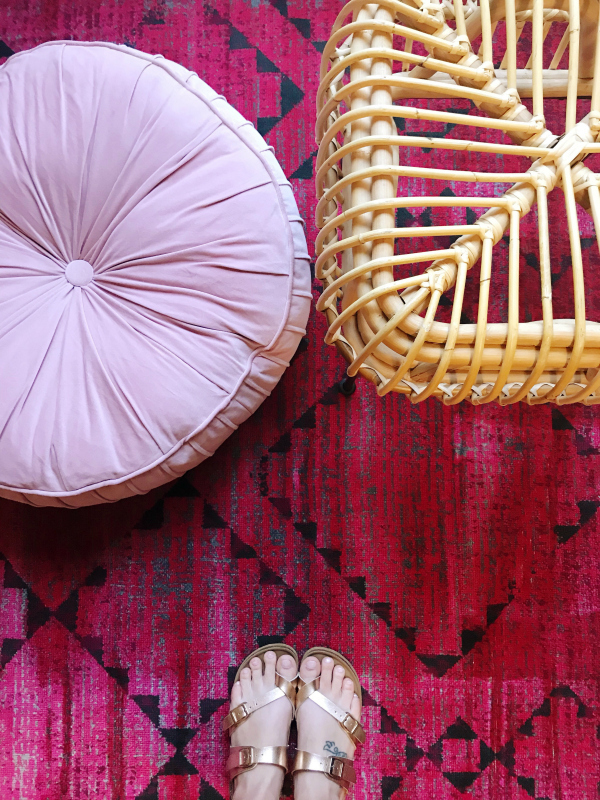 I have been hunting for the perfect pink area rug for our living room for months now and I couldn't find what I was looking for, especially in the price range I needed. I saw this rug in the outdoor furniture section at Target and absolutely loved it but passed on it because I was hung up on the fact that it was an "outdoor rug." Well, after searching and searching, I came back for it because it actually can be used outside or inside. The colors are vibrant and I love the pattern! We have also been on the hunt for an ottoman that works as an additional seating option and a foot rest. Our old one also had a storage option, which turned into a place for my kids to shove all of their junk when I told them to clean up the living room. So, we decided we didn't want a storage option at all this time. I was looking something that was neutral and would go with any rug that I picked. I immediately loved this one when I saw it online last Sunday! It wasn't love at first sight when my husband saw it online but when we found it in the store, he quickly changed his mind. The quality is really fantastic too! I'm thinking of getting the matching chair for my desk! The last item we picked was another pop of pink for our space! This floor pillow is another great seating option. It's also super soft and my husband plans to put it on top of the ottoman to make it cozier when he's ready to put his feet up. I also just really love the pretty blush color! 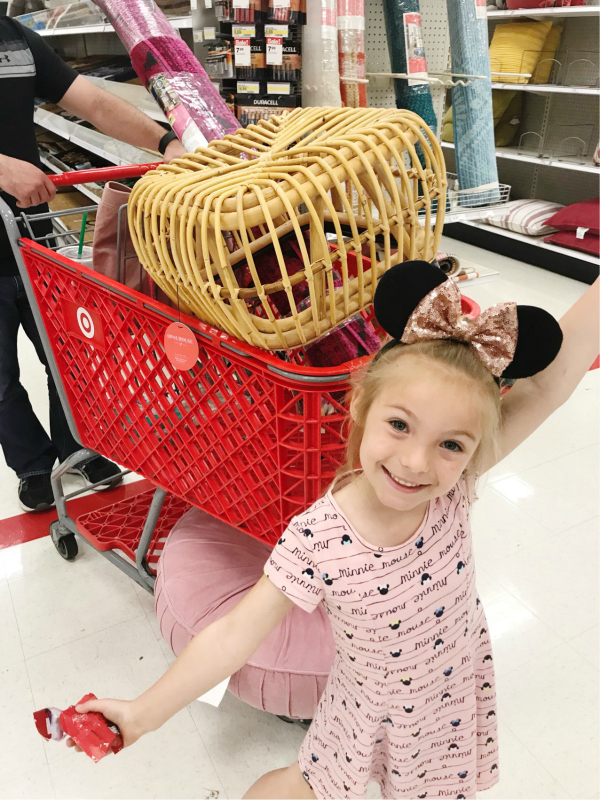 The picture below is my sweet Olivia being super excited that our cart was full of pink items for our house! I have never seen the girls so excited about home decor before! Thank you so much for stopping by! I hope you have a great Monday!